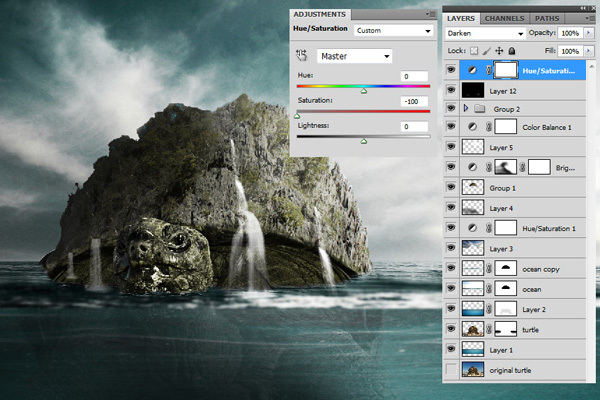 Immersion in Photoshop, Incredible photo manipulation tutorial. 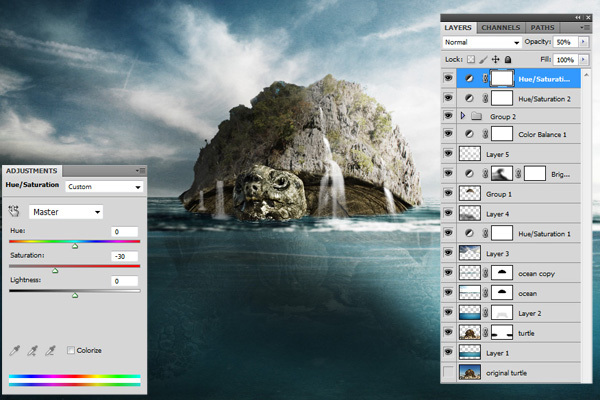 You know that the designers pretty often use Photoshop in their works, as the main tool to make creative and exciting pictures. 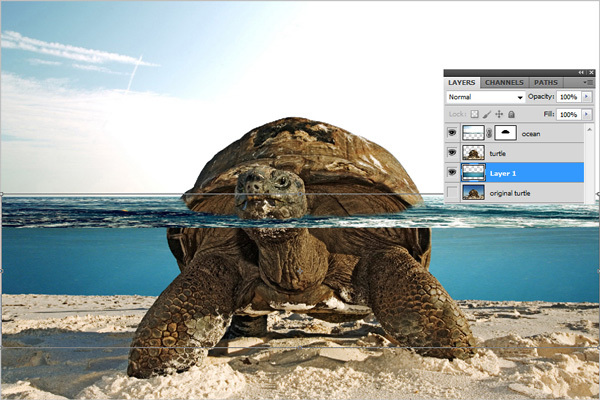 The most common practice is Photo manipulation, it’ll works on website or poster printing. 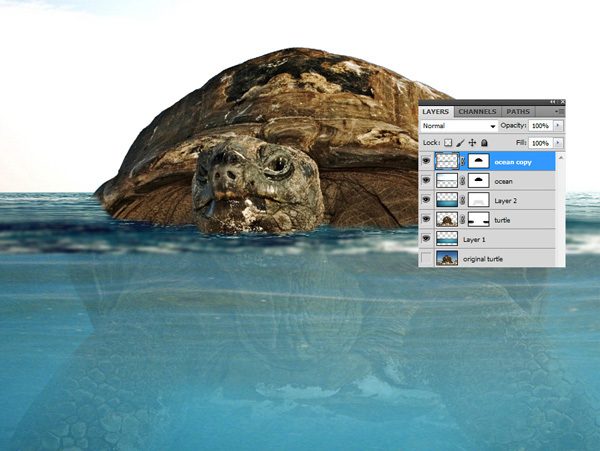 You may think that photo manipulation is boring and unrealistic, but it’s not entirely true. There are a lot of pretty good examples, when the photo manipulation amazes with its realism and mastery. 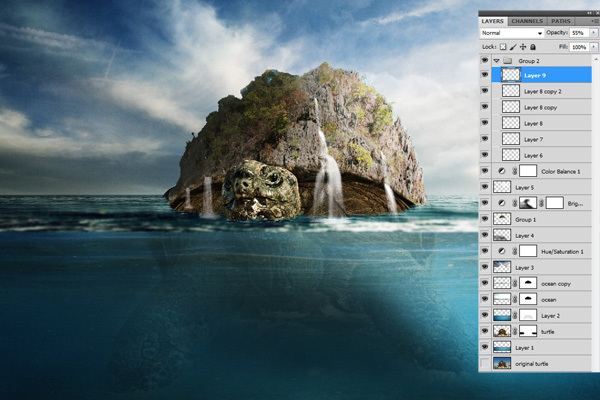 Today we’ll try our best to create incredible photo manipulation by following the tutorial step by step. 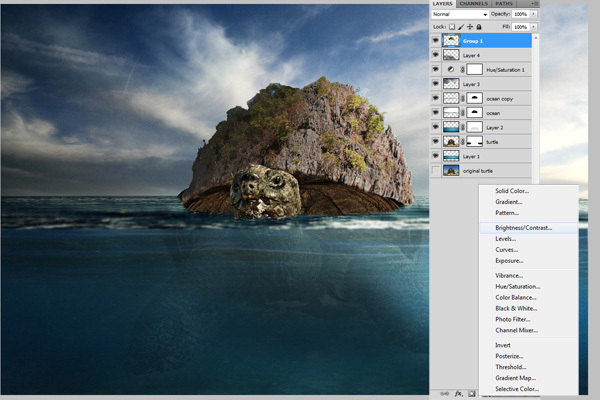 So, let’s try to immerse in Photoshop, create a great Photo Manipulation using Photoshop and Print them with Poster Printing Services to show your unique creation. My choice has stopped exactly at this turtle because it has a great hump, which will be useful in the future. 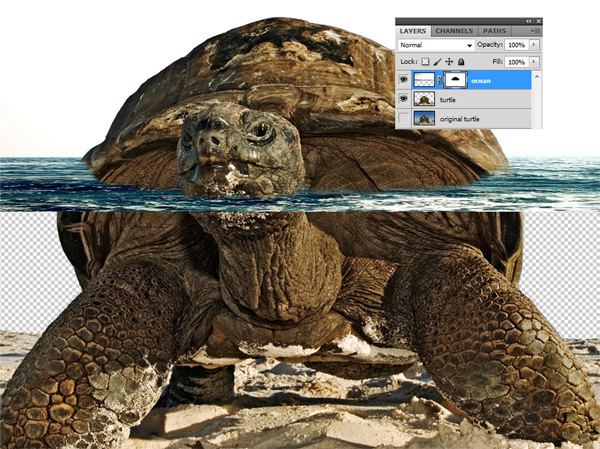 Duplicate the original image with a turtle (Ctrl + J) and hide the lower (first) layer. 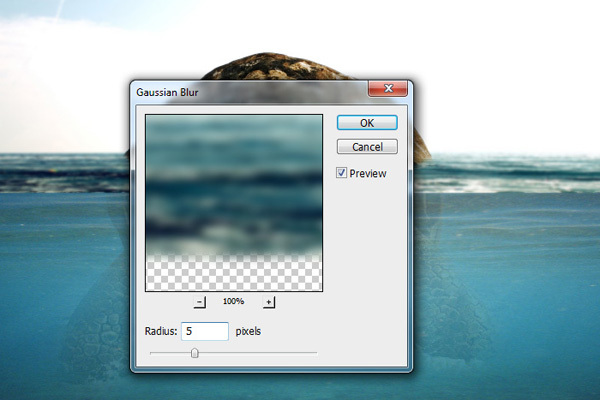 Now erase the sky, as shown in the image below. You can use the Eraser Tool or erase the sky in either way you know. Leave only the turtle and the sand. 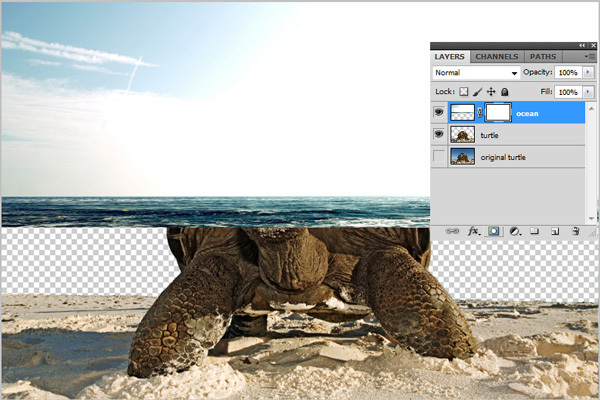 Name this layer with a turtle – “Turtle”. 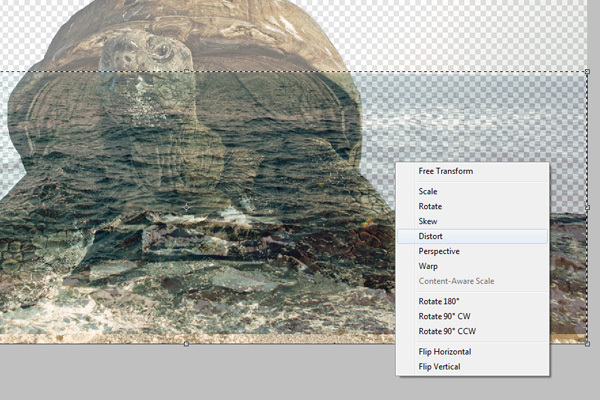 After the selection, press Ctrl + T and click the right mouse button to see the drop-down menu, then choose Distort. 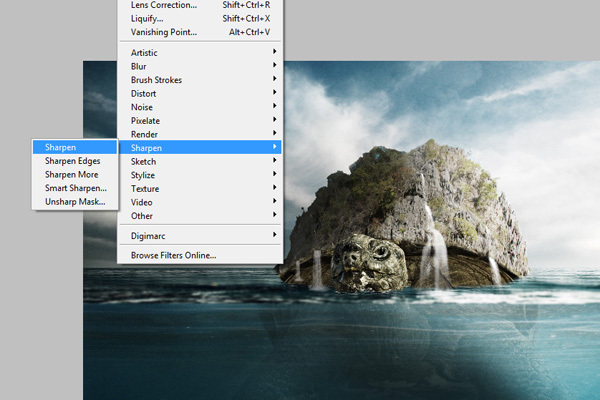 It’ll help you to distort the edges of the selected area. 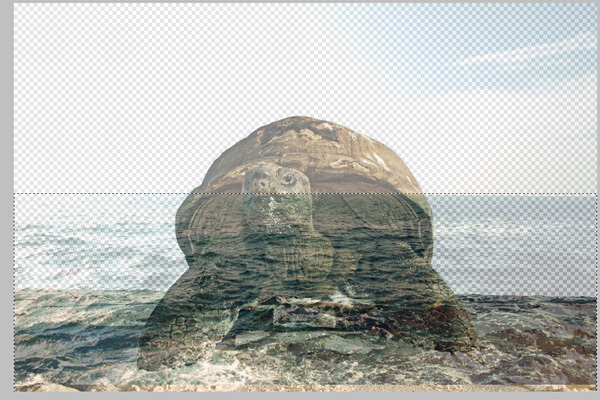 Distort the lower edges, as it shown in the picture below. Make it realistic, we need the water looks blended with the general picture. We need the original lighting of the sky and it’s the opposite of the coverage on the turtle. 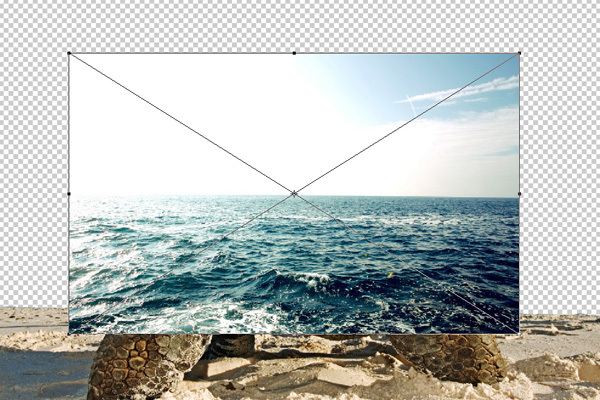 So, we need to press Ctrl+T in the picture of the sky and the ocean, right-click and select Flip Horizontal. 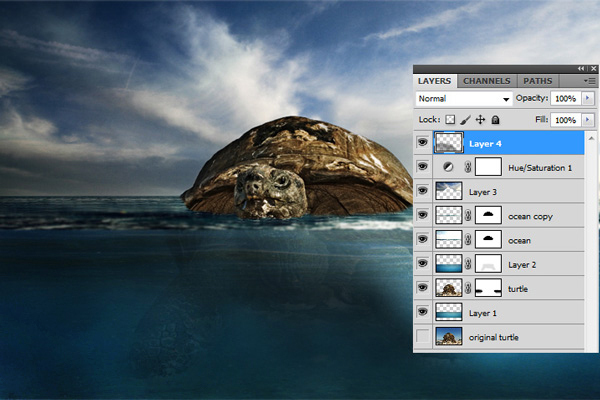 Rename the layer with the ocean to “ocean”. 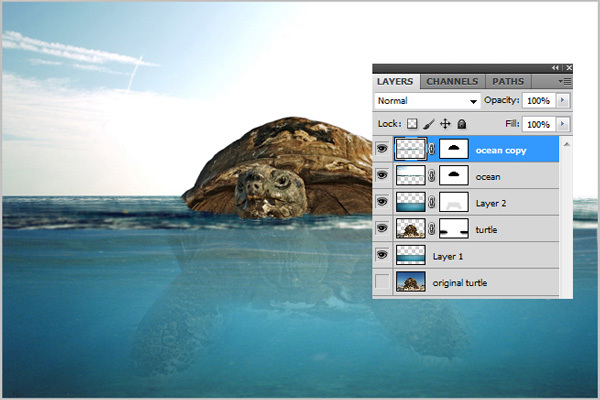 Create a layer mask (Clip Mask) on a layer of “Ocean”. 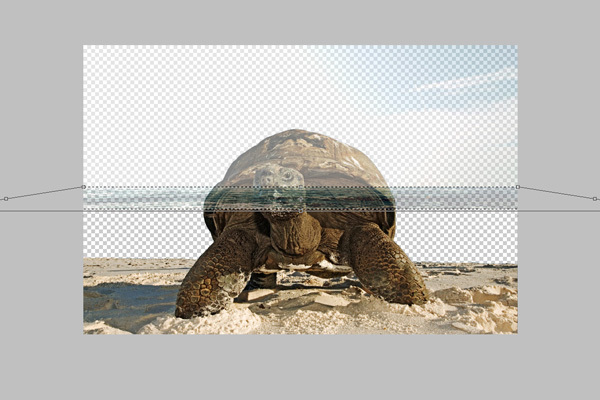 Now create a layer mask (Clip Mask) on the “Turtle” layer and erase with a Soft Brush, sharp edges of sand behind, as shown below. It’ll give the prospect of an underwater scene. 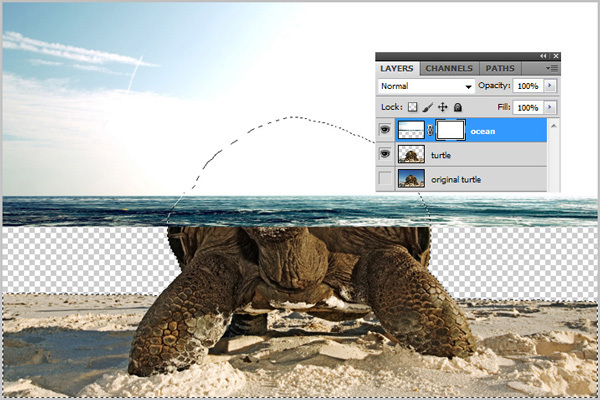 Now lower the bottom layer with a blurry ocean in just a few clicks of the keyboard keys (arrow down), by choosing the Move Tool V (Move Tool). 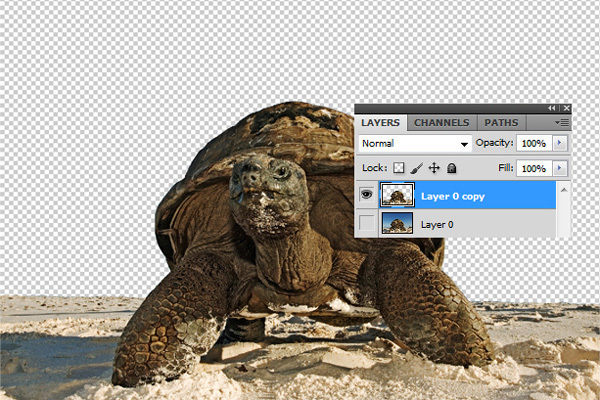 Now erase the top part of this layer, leaving only a blurred border. 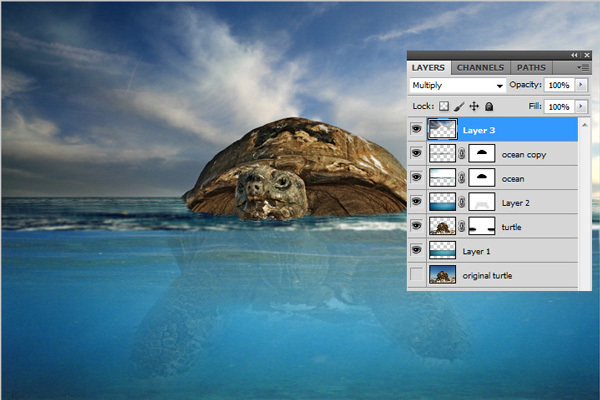 The basics of how to create underwater images have been explained. Now we’ll work with lights and shadows, as it would be easy to explain step by step how to do it. 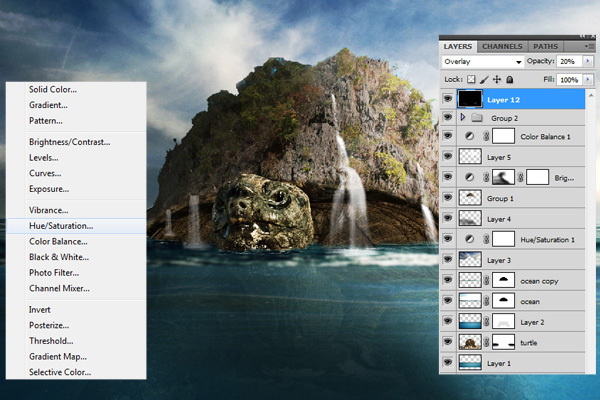 Take the picture with the Landscape, you’ve downloaded in the beginning of the tutorial. We need just the sky from this picture. Separate it from the ground, choosing the most convenient way for you. We’ve made it with Rectangular Marquee Tool and inserted into the document. Erase the unnecessary parts. 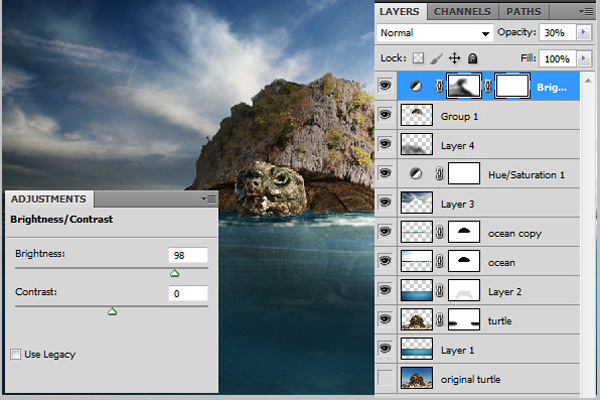 Then, set the layer mode to Multiply. Change the settings as it shown below. 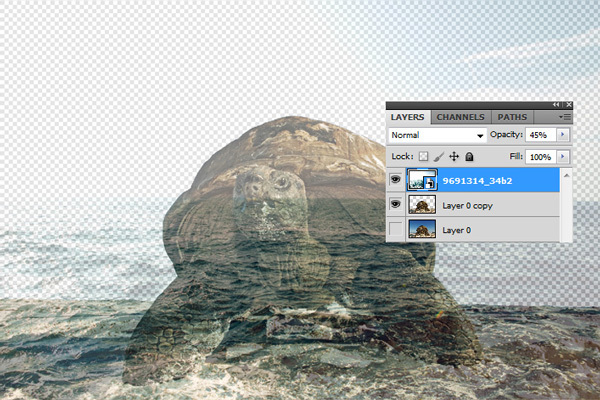 Create a New Layer (Shift + Ctrl + N). 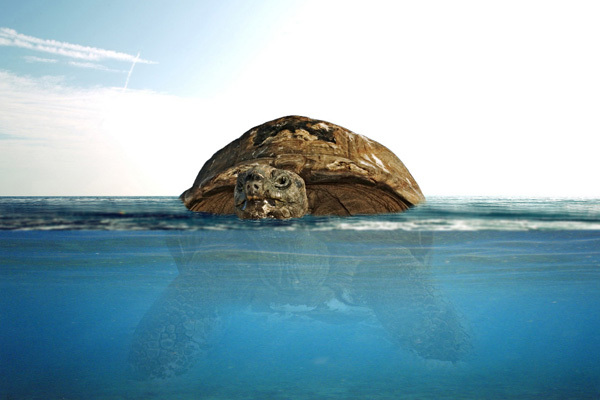 Then take a Black Soft Round Brush with a small opacity and darken the underwater space on the left and under the turtle’s body, as it shown below. It’s a simulation of light, which does not penetrate into the water column, leaving the shade. 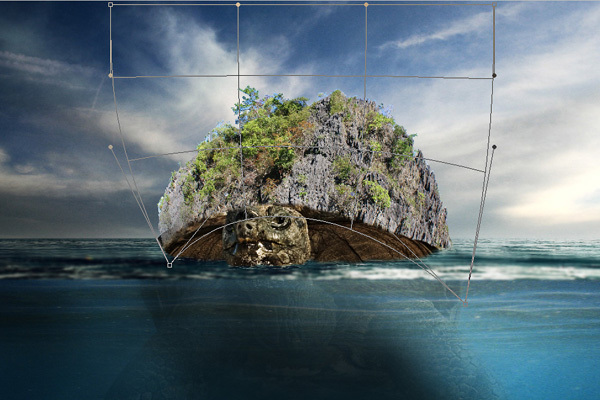 Open the image of the island. Separate the island from the background in a way which you think it’s more convenience, we did it with the help of Quick Selection Tool, a call key W. Then paste it into the document. 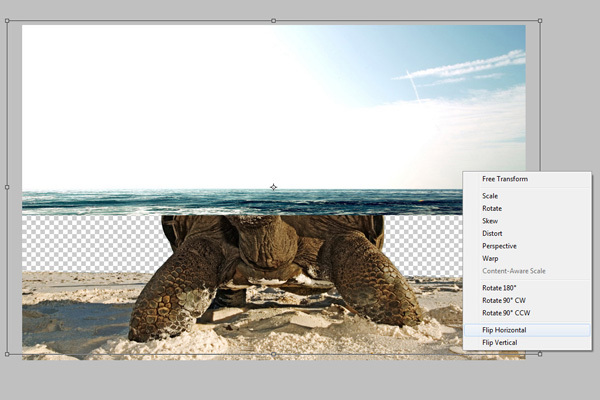 Press Ctrl + T, hold down Shift, and reduce the image down to size. 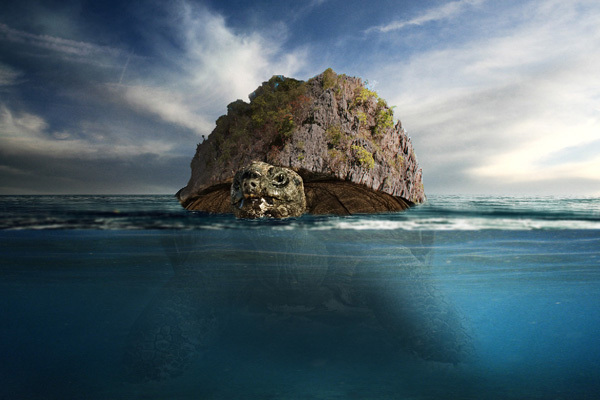 Place the island on the hump of the turtle. 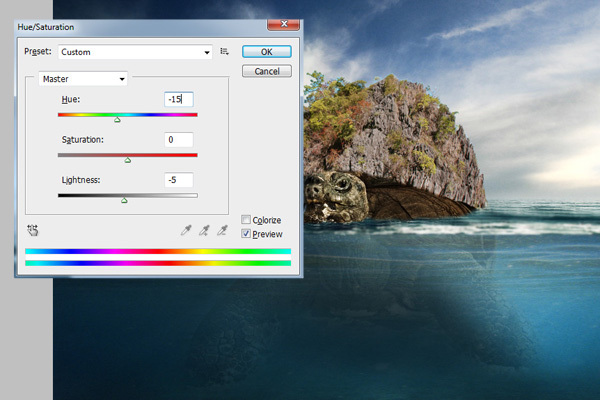 In adjustments choose Hue/Saturation and make the changes as in the picture below. 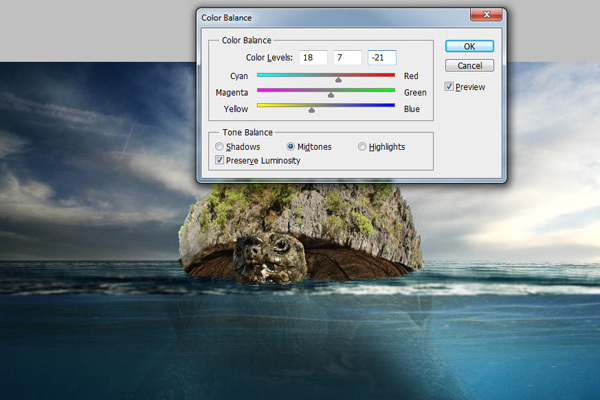 Then choose Color Balance and change it as in the picture below. Here what you should have in the result. Change the Color Balance again. 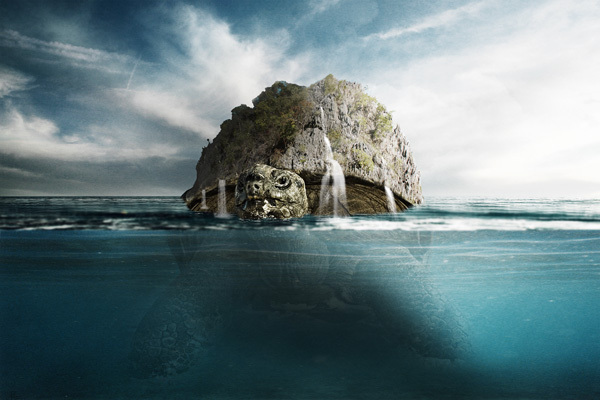 Now we need to give a little bit of chaos around the clutches of turtle – the sand and bulb. We need a brush like a dripping or splashing water. Although this step can be skipped, or try to do another way you like. 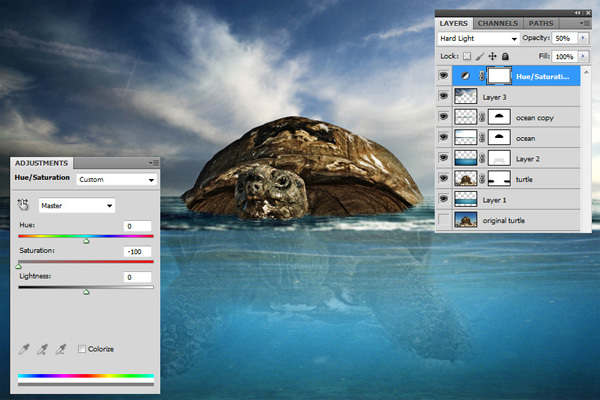 Blending Mode – Overlay. 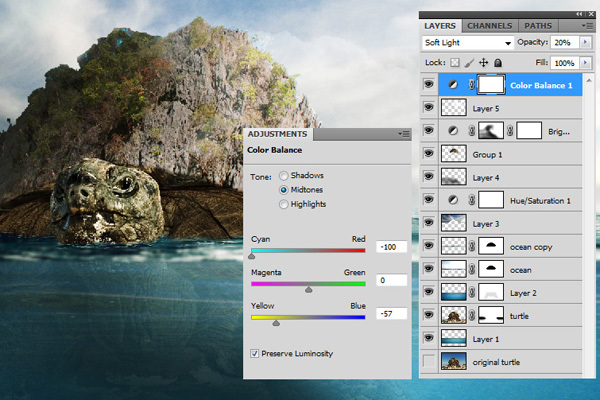 Create a new adjustment layer Hue / Saturation : Saturation -100, Blend Mode – Darken. 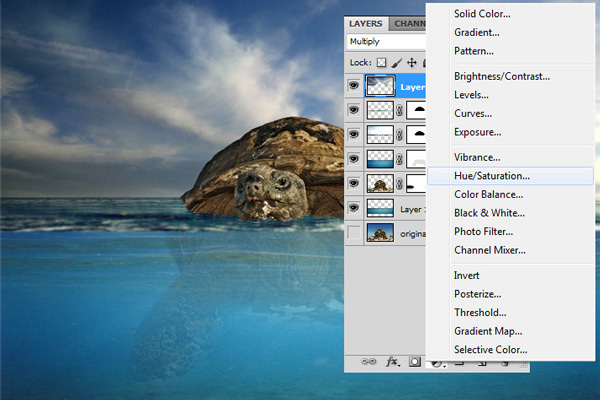 Create another adjustment layer Hue / Saturation: Saturation -30, Blend Mode – Normal. 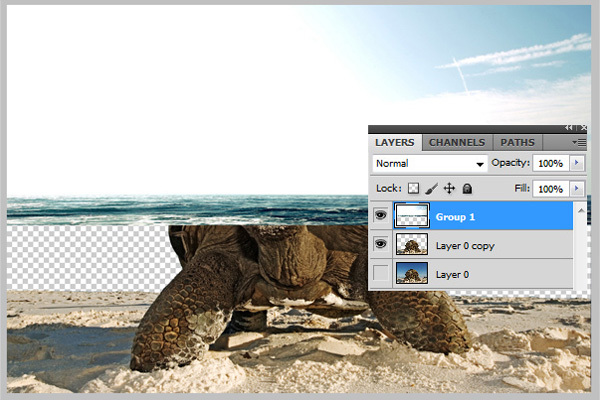 Merge all layers by the key combination Shift + Ctrl + Alt + E. Then place it on top of this layer and add a little sharpness with Sharpen filter. Here is the final result. 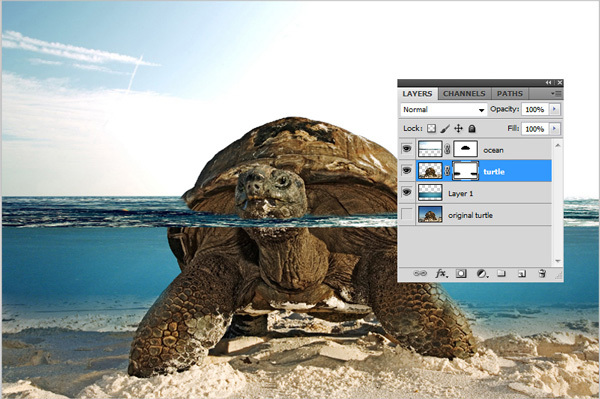 Hope you like the Photo Manipulation Tutorial. Don’t hesitate to ask anything you want in the comments below.